Cranberry plant, Vaccinium macrocarpon, is also known as American Cranberry. 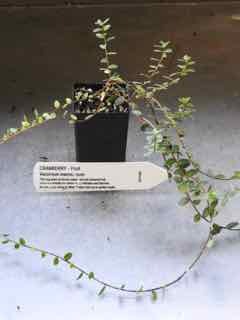 A rhizome based shrub that produces small pinkish flowers in the late spring or summer. Flowers are followed by edible, tart red coloured fruit. Traditionally used in the US in jams, jellies and pastries. Cranberry juice and extract is currently being used as a remedy for urinary tract infection and diarrhoea. Cranberry plant is native to north eastern North America. An evergreen shrub growing to about 30cm. Prefers full sun to partial shade in wet (bog) soil. Be the first to review “Cranberry, plant” Click here to cancel reply.